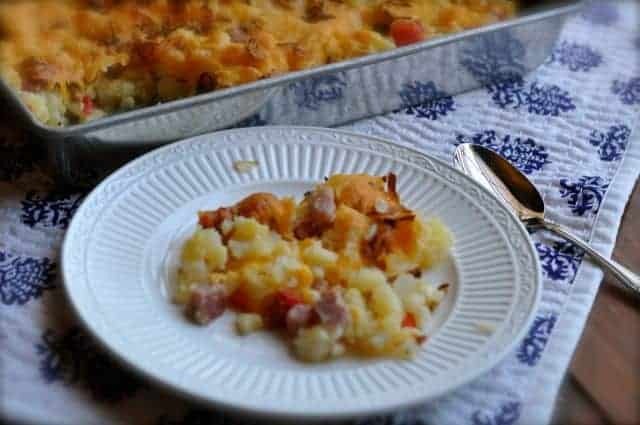 Glorified Hash brown Casserole is a dish you will like if you enjoy the well known Hash Brown Casserole. What makes this recipe different? This one is hearty enough to enjoy as a whole meal. This one features ham, bell peppers, and onions to make this one very hearty. When growing up I didn’t think casseroles with potatoes got any better than that a cheesy potato casserole. This recipe has had a few updates. First off this one really can be eaten as a meal. By adding ham and sauteed vegetables we have a dish that is filling enough for a meal. Also, this recipe is a little lighter in the fat content, we aren’t using the sour cream. You won’t even miss the sour cream in this one. I think dried onions tend to give a milder flavor. this sounds good, i can see myself serving this with sunday dinner. thank you for sharing! This is one of those great recipes for evenings when you’ve got no time (or motivation) for wrangling the details of a complex recipe. This is simply chopping + sautee’ing a couple of veggies, then dumping all the store-bought ingredients into a pan and baking it up. Tastes great, and is very satisfying. (Made mine with a can of cream of chicken soup, since we always have those in the cupboard.) As a bonus, it tastes just as good reheated for a microwaved leftover lunch. I am a big fan of recipes like this. I don’t always like putting a lot of effort into a meal. This dish also tastes very good reheated. Which means it is a great dish to bring to work and heat up. Thanks for this recipe (and video) for glorified hash brown casserole. It looks like quite a delicious dish. What’s the purpose of adding the soup – flavor or consistency? I’m not a fan of using canned soup in my cooking so I’m wondering why it’s added so I can come up with a substitution. It gives the casserole some something to help it all stick together, and adds some flavor. If you don’t like this, you may want to add a simple white sauce that is flavored with onion or something like this. Sounds good, except for the soup. Absolutely hate Cream of Celery soup. I’m assuming Cream of Chicken or C of Mushroom would do? You can use any creamed soup you would like in this recipe. I suggested a few in the video.